Monday 2nd February 2015 – 12.30pm – Claire Brown. 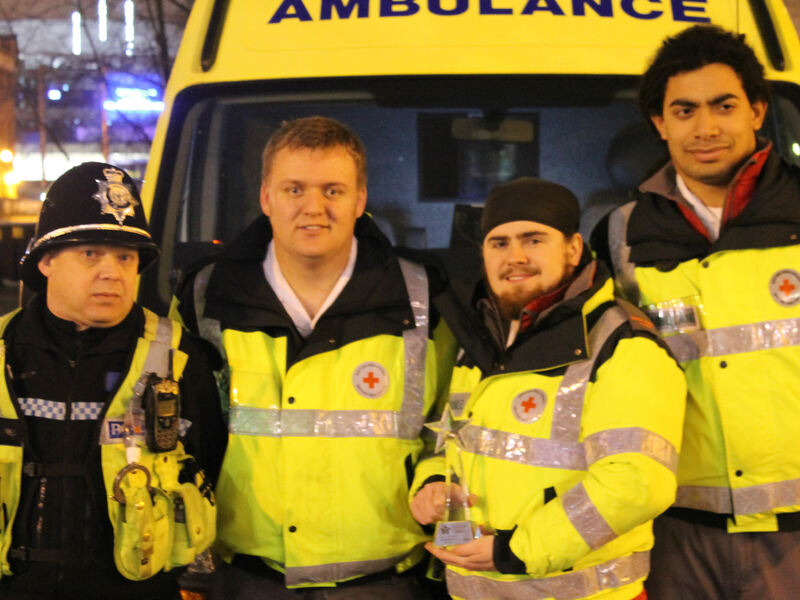 Volunteer life-savers who work shoulder-to-shoulder with ambulance staff on Birmingham’s ‘Golden Mile’ each weekend have been recognised for their dedication at the City’s Best of Broad Street Awards (BOBS). Now in its 10th year, the BOBS recognise venues, individuals and teams that work in Broad Street. The Trust’s City Centre Treatment Unit (CCTU), which operates each Friday and Saturday covering the city centre, is staffed by West Midlands Ambulance Service and supported by volunteers from St John Ambulance, British Red Cross, Community First Responders and special constables from West Midlands Police. The BOBS awards, which was held at the International Convention Centre on Sunday 25th January, recognised the work of these CCTU volunteers and scooped the ‘Best Volunteer’ award. The CCTU provides on-site pre-hospital treatment to members of the public who are suffering from minor injuries or conditions or have had too much to drink. The unit not only helps to reduce the number of patients attending A&E but also frees up ambulances to respond to more life-threatening conditions. Pictured (left to right) West Midlands Police Special Constable Phil Oldacres together with British Red Cross volunteers Dom Pumphrey, Alex Hayward and Nathan Douglas.